Let Us Fight Your California Traffic Ticket For You! Traffic tickets are more than just a nuisance. Though you can readily dispose of most tickets by simply signing your citation on the back, admitting guilt and sending in your fine or doing it online, the problem is that traffic fines can be several hundred dollars and result in a point, or points, on your driving record. Get too many points and you will have your license suspended. Your other alternative is to fight your ticket and this is where WeFixTicket comes in. Having a local, licensed and experienced traffic attorney representing you will give you the best opportunity to get yourticket dismissed, obtain a not guilty verdict or have the violation reduced so that no points appear on your record and your insurance premiums are unaffected. Do you have a warrant out for your arrest for failing to appear in court or for accumulating too many unpaid traffic tickets? All motorists are required to have a valid driver’s license when operating a motor vehicle on California’s roadways. if convicted. You do have options…..
who handle a wide variety of traffic violation and related matters in your area. Our WeFixTicket attorneys charge very reasonable fees that are affordable to nearly anyone who wants to challenge a ticket. We are able to charge economical fees not only because of the volume of cases we handle but mostly because of our highly efficient manner of quickly resolving traffic tickets to the satisfaction of our clients. If you have a moving violation conviction, your driving record will be assessed at least one point. Accumulate too many points in a short period of time and you risk suspension of your driver’s license, not to mention a substantial increase in your insurance premiums. A driver with multiple violations also risks being labelled a Habitual Traffic Offender, meaning that any subsequent violations will carry greatly enhanced penalties. When you hire one of our WeFixTicket lawyers, chances are that you will never have to appear in court as our lawyers will go to court for you. You will have to make an appearance if your charge is a DUI or other serious misdemeanor charge. Our record of getting tickets dismissed, obtaining not guilty verdicts or in reducing your ticket to a non-moving violation is phenomenal. As a result, you keep your driver’s license, pay no fine, serve no time in jail and keep your insurance rates the same. If a warrant has been issued for your failure to appear in court, we will argue before a judge to have the warrant quashed and appear in court for you on the original charge. Should you be incarcerated following your arrest on a warrant, our lawyers very often can get you released OR, or on your own recognizance and with no bail imposed. 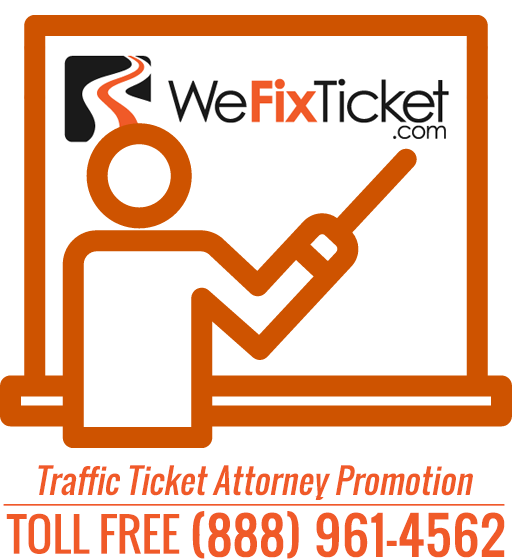 Call WeFixTicket today if you have a traffic ticket and let us see what we can do for you.